Artists specialized in new media, they have created several artistic interactive installations. These creations have been shown in nearly twenty exhibitions in France. 1 The Miroir [mirror] project is an interactive installation for augmented reality, created in 2011 by Sophie Daste, Karleen Groupierre and Adrien Mazaud. This interactive space is a Victorian style carpeted living room. Through the heap of odd objects it contains, the space is reminiscent of an old cabinet of curiosity. A chair takes the center of the setting, inviting the spectator to sit in front of the mirror. When sitting down, the spectator sees a ghostly animal head superimpose onto their own face reflection. The anthropomorphic double coming from a literally augmented reality, follows each and every of their movements and expressions. Spectators in front of Miroir. © Sophie Daste, Karleen Groupierre and Adrien Mazaud. 2The illusion begins as soon as the spectator enters the room. Thought like a jewel case, the room protects this surreal environment from the reality of the outer world. Spectators’ augmented reflection in Miroir. 3This whole set-up relies on the fantasy of seeing, through the mirror, a hidden truth. The mirror is only semi-tinted, and the wall on which it is hung is not a wall, but a false background, concealing the machinery required for the creation of this illusion. 4Five speakers are placed in the room. Their combined action gives the spectator the impression that sounds are moving around them. This sonic atmosphere is part of the spectator’s immersion into the oneiric world of the Miroir. Technical diagram of the Miroir. 5The spectator, dazzled by the set lamps, sees their reflection in a semi-reflecting mirror, as long as what is behind the mirror (back-room area) remains dark. As soon as the webcam1 and our program detect a spectator’s face, the animal’s face is projected onto the back wall (behind the mirror, onto the projection surface). The projected image is black, except for the animal face that is visible to the spectators (as well as their reflection). Recording and production of the spatialized sound atmosphere. 2 SDK (Software Development Kit). 6This project was carried out on the software Unity to which was integrated the Face API SDK.2 This SDK allows to track in real time the movements of a face filmed by a webcam (in 3 dimensions), and this, without imposing onto the spectator any markers or any excessive calibration time. 7The choice of the animal head depends on the morphological data captured by the camera. 3 Blend Shape (Shape deformer): changes the shape of the 3D object, from smile to open mouth, etc. 8The movements and expressions received are correlated with the movements and expressions of a 3D-modeled animal head. Although the algorithm is still in development, through the use of blend shape3 all major modeled expressions can be combined and mixed, providing a great variety of animations to the animal face. Screenshots of different zebra Blend Shapes. 9Thus, if the spectator opens or closes their mouth, smiles or winces, the creature will do the same in its own way. 10Since 2011, The Miroir set-up appeared in several exhibitions allowing a study of the public’s reactions. The spectators’ reactions are varied, some of them laugh, others are startled or scared. Some see an animal mimicking them, others see their totem. During the Miroir project exhibit in Hong-Kong at the Siggraph Asia festival, several student groups ranging from 12 to 16 years old tested the set-up. We noticed a cultural phenomenon that the authors did not expect: young hongkonger ladies, startled by the apparition of the animal face onto their own face were driven, as a reflex, to cover their nose and mouth with both hands. However, the illusion relies on the detection, for facial tracking, of the basic elements of a face, an oval, eyes and a mouth. By hiding their faces the girls made the animal face disappear in the same time. When a girl let her hands down, the creature, just as its shy audience, reappeared startling the girl anew. The young girls had to tame an illusion that appeared as fearful as they were, reality and the illusion appeared mutually impressed by the presence of one another. Ars Electronica – Linz (September 3rd-7th). Festival MISS (Maison de l’image et du signe de Sevran) – Sevran (November 4th-8th). Festival SIANA – Evry-Courcouronnes (April 16th-28th). Symposium SIGGRAPH Asia – Hong-Kong (December 12th-16th). Savante Banlieue – Université Paris 13, Villetaneuse (October 13th-14th). Festival Dimension 3 – Plaine Saint-Denis (May 24th-26th). Festival Laval Virtual – Laval, France (April 6th-10th). 1 The webcam is concealed under the mirror. 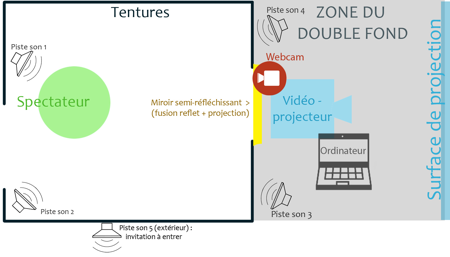 In the video presenting the installation, the different cameras shown in the reflection of the mirror are not part of the installation, they simply are either the spectator’s camera to take a picture of themselves and their reflection or a camera to film the user. Sophie Daste, an artist-researcher, PhD student within the TEAMeD team (theory, experimentation, arts, medias and design) – under the supervision of Jean-Louis Boissier, and associated to the laboratory AI-AC (Art des images et art contemporain – Art of images and Modern art) and project leader of one of the Labex Arts-H2H’s projects (Laboratoire d’excellence des arts et médiations humaines – Laboratory of excellence in arts and human mediations) at Paris 8 University. Her research fields lie in the fictional spaces created by new the media of the otaku and geek cultural generations. Karleen Groupierre is an artist-researcher, associate professor in the laboratory LLSETI (langages, littératures et sociétés - études transfrontalières et internationales – languages, literature and societies – transfrontier and international studies) at the University of Savoie, researcher associated to the laboratory INReV (Images numériques et réalité virtuelle – Digital images and virtual reality) at Paris 8 University and member of the research collective OMNSH (Observatoire des mondes numériques en sciences humaines – Observatory for digital worlds in human sciences). Her PhD thesis dealt with aesthetics, sciences and technology of the arts: “Enjeux des transmédias de fiction en terme de création et de réception”, under the direction of Marie-Hélène Tramus (July 2013 – Paris 8 University).